← Home is where the heart is. And the heart never really leaves home. This brought tears to my eyes. I can see how this little angel is working through you to help heal her family. It’s been an extraordinary journey. Grace was a gift. I wish I could have known her. Very moving Sue. I say that with tears in my eyes and a heavy heart. Until her parents meet her again may they find solace in knowing that she has not been forgotten. Grace was a light. My hope is the prayers for her family will help sooth their suffering. Holidays can be especially difficult for those who’ve recently lost loved ones. Thank you for reminding us to keep them in our prayers. Lovely post. It’s hard to imagine that kind of loss. I am hoping Grace’s family will feel all the love sent their way. and surround her Mom and Dad. It’s a beautiful painting, Sue, and a beautiful gesture. I’m sure Grace’s family will treasure it always. Thank you for sharing. Sue you captured spirit and hope. Beautiful portrait and post. Thank you. What a beautiful gift, Sue. Thank you Sue. You offer the beautiful, gracious, and loving through your lovely heart and art. I will add my prayers to yours and others for this family. May your lovely portrait bring them peace and good memories. Sue what a beautiful sentiment and gift. I’m sure Grace’s family will treasure it along with the loving memories they have of her. Thank you for sharing and Happy Holidays to you and your family. You are an amazing artist! I love to paint and I have since childhood. Coming across the portrait of Grace, I knew who she was before I read her name. I will never forget those blue eyes, and I recognized the lighthouse in the painting. I knew it was Martha’s Vineyard. It is where I was raised, along with many generations of my family. I knew Grace had a connection to the Vineyard, and then the awful truth sunk in, she was killed at Sandy Hook. My heart was broken for her family. I prayed for them and the other parents. So senseless. May God watch over them. 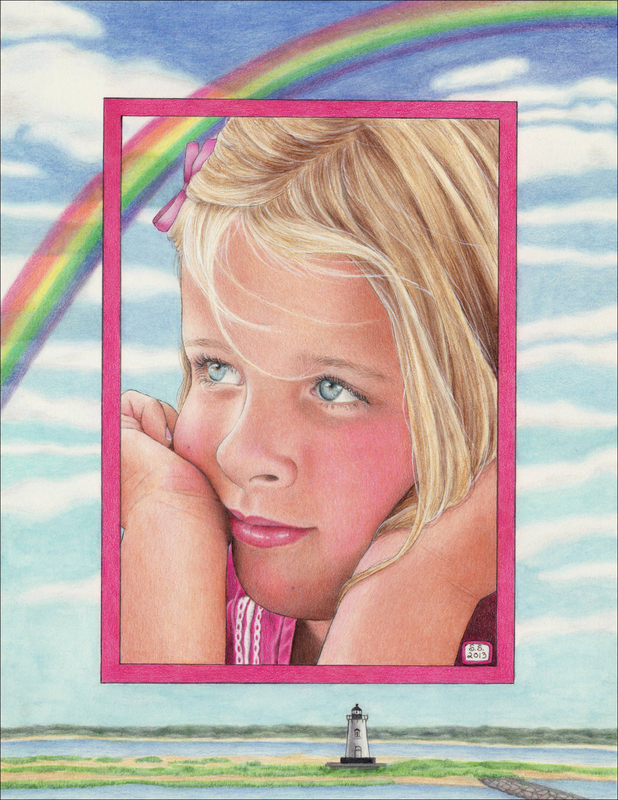 Thank you for your beautiful painting of this beautiful child, & your gentle way of approaching her family. Our world needs more of this compassion.